One of our longest and most highly respected pottery teachers on Obby, Edit Juhasz teaches her pottery introduction as a 4-week course. At a total of £200, this is an investment for someone who wants to dedicate some time to pottery. If you’ve already attended one of our taster sessions and you know this art is for you, this is the perfect investment to get you going. Once you’ve completed this course, you’ll have some finished pieces and the experience and knowledge to begin solo practice. We can’t guarantee you’ll be a pro, but you’ll know your stuff once the four weeks are up. Odile fell in love with pottery after attending an evening course herself which is what makes her attention to detail so brilliant. She has experienced teaching workshops from both the teacher's side and the student side, so she has an extra personal touch when it comes to passing on her knowledge. Her classes are held at a beautiful contemporary studio, filled with plants, in Maida Vale. You can either learn wheel throwing or hand building and they are £30 a session. 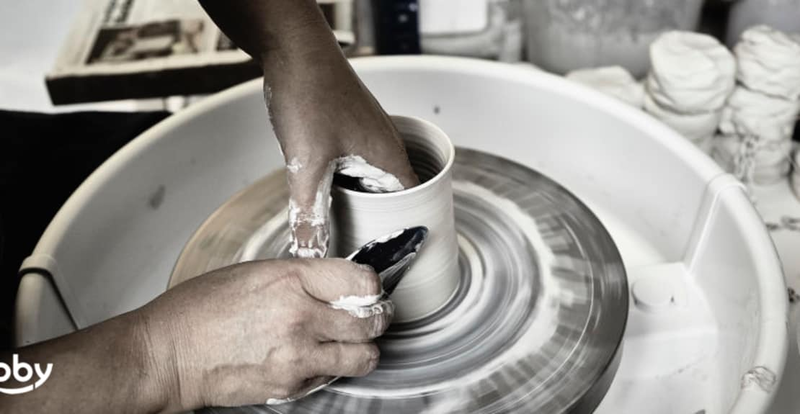 Martha has 13 years of ceramics experience, including a masters degree in it. She is also currently researching for a PhD based on figurative sculpture in contemporary art. The taster workshops are only £25 including your glazing and firing and the classes are always small and intimate. These are our best value for money class on the Obby, with the reviews still reaching 5 stars regularly! Freya’s pottery club is a friendly family run studio, run by the father-daughter team, Chris and Freya Bramble. Chris has been practising pottery for years and it has always been a part of his daughter Freya’s life. Classes start at £45 with an extra £15 if you would like your finished pots to be fired, glazed and then sent to you.